When Lee Simone decided to write about Fluxaf Power Clean and cleaners and degreasers for paint it was mainly because, at the time, Krud Kutter Original was unavailable and it was unclear if and when it would ever come back to the UK market. As it happens it did come back (and seems unaltered in his view) but here are a few thoughts on some of the alternatives tested whilst Krud Kutter Original was unavailable. As we all know, preparation is pivotal in achieving the best possible finish, and cleaning and degreasing any furniture or kitchens is one of the first and most important stages in the process. I used all the products below on the same kitchen project with the kitchen scoring a solid 6-7 out of ten on the mucky scale. 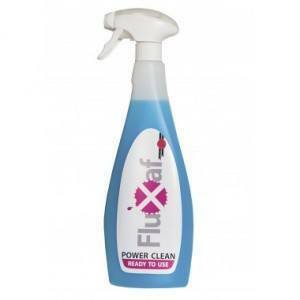 One of the first I tested was Fluxaf Power Clean. I had already tried their ‘Pro Clean’ and was keen to try this alternative. 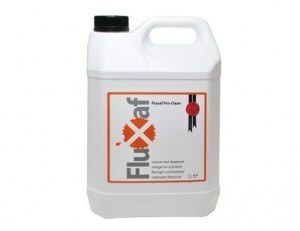 This was the original cleaner and degreaser produced by Fluxaf in concentrate form and unfortunately it doesn’t work for me, though I have heard good reports on it’s quality from other specialist painters. In my opinion it’s not in the same league as their ‘Power Clean’ or ‘Krud Kutter’ and seemed to really struggle with some of the grease and dirt on this kitchen. 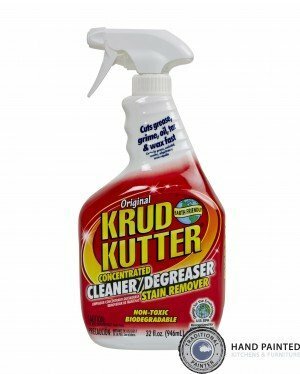 I started using ‘Krud Kutter Original‘ quite a few years ago and it’s still my go-to cleaner for many of my furniture and kitchen projects. 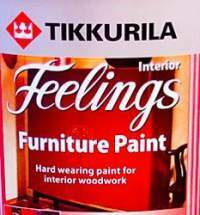 It’s dealt with everything I’ve thrown at it and believe me, it’s had a good work out in some of the kitchens I have painted! When I set about doing my comparison tests I honestly thought there would be more of a marked difference between the products, but in my experience all bar one worked really well and there was very little in it. In my opinion you can’t go wrong with either the Fluxaf Power Clean, Krud Kutter Original or Holmans own, as each should deal with most kitchen and furniture cleaning jobs you throw at them. If you would like to learn more about the materials I use and the processess I undertake on hand painted kitchen and furniture projects, please visit my website – www.imaginativeinteriors.co.uk. 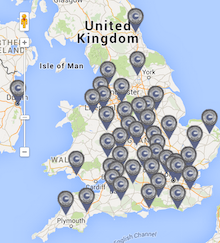 I am the Traditional Painter for Yorkshire. Thanks for reading! 🙂 and please remember that if a product is able to remove grease from paint, it can easily remove oils from your skin. Take precautions with personal protection. 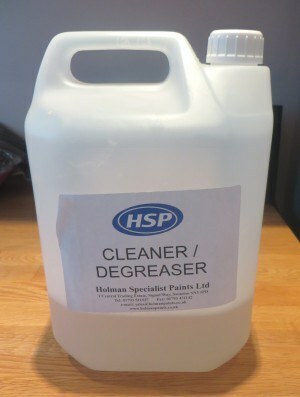 Applying via spritzer goes a long way to reducing direct contact with a degreaser.